Australia recognises that supporting the research, development, demonstration and deployment of clean energy technologies is necessary to transition the world’s energy sector to a lower emissions future. Along with other Mission Innovation members, Australia has pledged to double government clean energy research and development expenditure by financial year 2020/21. We also want to encourage greater levels of private sector investment in transformative clean energy technologies. In 2016/17, Australia’s public expenditure on clean energy research and development increased to AUD$129 million, representing a 20 per cent increase relative to the 2015/16 baseline of AUD$108 million. The baseline excludes research and development spending on fossil fuels, electricity generation and transmission and distribution technologies, recoupable investments made by the Clean Energy Finance Corporation (CEFC), and expenditure on later stage demonstration and deployment. Australian scientists and researchers are making world-leading contributions to the development of clean energy technologies such as in solar PV, solar thermal, hydrogen, and smart grids and storage. The Australian Government will continue supporting our world class universities and research institutions to further collaborate with international colleagues and organisations, to unlock new ideas and transitional pathways in the energy sector. Australia is excited by the opportunities for future research and development collaboration under the Mission Innovation’s Innovation Challenges. Australia has active research underway in many clean energy technologies relevant to the Innovation Challenges, and is particularly interested in collaboration opportunities under the Smart Grids, Carbon Capture, Converting Sunlight, and Affordable Heating and Cooling of Buildings challenges. Australia will be co-leading a new Innovation Challenge on Hydrogen. We look forward to collaborating with interested countries and with existing international co-operation forums to identify and overcome key technical barriers to widespread production, transport, storage, and use of hydrogen. The Commonwealth Scientific and Industrial Research Organisation (CSIRO)’s Low Emissions Technology Roadmap for Australia made recommendations on where to focus Australia’s future domestic clean energy research and development and international collaboration opportunities, to deliver clean energy solutions. The Roadmap identified opportunities for both domestic hydrogen and a hydrogen export industry. Hydrogen as an energy storage medium would enhance domestic energy system security, and could also be exported to neighbouring countries such as Japan, Korea and China, as they look for ways to diversify their energy mix and reduce carbon intensity of their energy sectors. Australia’s abundant renewable energy resources are well suited to the production of zero-emissions hydrogen, which requires abundant cheap renewable electricity. In November 2017, the CSIRO launched a Hydrogen Future Science Platform. This involves investing AUD$13.5 million into hydrogen fuel research to enable the development of technologies that allow Australia to export its solar energy, as well as providing low emissions energy solutions for Australians. The Australian Government is further encouraging increased research and development work in the hydrogen supply chain through an AUD$20 million R&D funding round, announced in late 2017. Hydrogen production, conversion to a carrier for transport, storage or export, and transformation into energy at point-of-use are all stages of the hydrogen supply chain that have significant potential for cost reductions. CSIRO has developed a metal membrane which allows high-purity hydrogen to be separated from ammonia. The technology, now being trialled on an industrial scale in Australia, will allow hydrogen to be transported and used as an energy source. Hydrogen is difficult to transport over long distances because it has such a low density. Ammonia is a good way of transporting hydrogen because it is denser than liquid hydrogen. The technology CSIRO has developed can then be applied at or near the point of use, converting ammonia back into hydrogen for use in transport fleets and electricity generation both in Australia and abroad. Australia is leading work on the Storage Integration work stream under the Smart Grids Innovation Challenge (MI IC1) alongside our UK counterpart. Australia also hosted an MI-IC1 workshop as side-event of the ISGAN ExCo15 meeting in Newcastle, Australia in March 2018. As part of Australia’s commitment to the Smart Grids Innovation Challenge, we will lead delivery of a partnership between the Mission Innovation Smart Grids Challenge and the Bridgestone World Solar Challenge in 2019. The Bridgestone World Solar Challenge is a biennial solar-powered car race which held its 30-year anniversary event in October 2017. The event has attracted world-wide media coverage, with participants from over 30 countries including 11 Mission Innovation countries competing over a 3000 km route from Darwin to Adelaide, in a car powered only by solar energy. support the next generation of clean energy researchers and entrepreneurs. In early 2017, the Australian Government, announced ongoing support for building flexible capacity and large-scale energy storage. Through the Australian Renewable Energy Agency (ARENA) and the Clean Energy Finance Corporation (CEFC), the Australian Government will also support related innovative technologies that boost the stability of the electricity grid, such as advanced control systems and smart grids. CSIRO has created the UltraBattery – an economical, super-fast charging battery with life cycle two to three times longer than a regular lead-acid battery. UltraBattery combines everyday lead acid battery and a supercapacitor, which makes it 70 per cent cheaper to make than nickel-metal hydride batteries with comparable performance, and can be made in existing manufacturing facilities. It was used by Honda in its Odyssey Hybrid model and has been commercialised by energy storage solution company Ecoult. UltraBattery is being tested in rural India by the Institute of Transformative Technologies and battery manufacturer Exide Industries. It has the potential to improve energy security in the world’s second largest country by population and reduce reliance on diesel generators. UltraBattery can store energy for use during peak demand times, thereby assisting the grid to balance supply and demand and avoid local stresses on the grid. This stabilising effect allows for a greater percentage of our energy supply to be generated by intermittent renewable source. Australia is committed to driving innovation and deployment of clean energy technologies on the world stage. Australian innovation has long been successfully commercialised in the global marketplace – for example, it is projected that University of New South Wales photovoltaics innovation will be embedded in almost half of all new solar panels sold globally by 2020. We will continue to build international partnerships to improve commercial opportunities for Australian renewable energy technology, such as the Australia-US Solar Thermal Research Initiative and the Australia-US Institute for Advanced Photovoltaics. In December 2017, the Australian Government announced AUD$29 million to twenty R&D projects that will further accelerate the development of solar PV technology, improving its efficiency and reducing its costs. Alumina refining in Australia is energy-intensive and relies heavily on natural gas. Through ARENA, the Government provided $4.5 million to a $15.1 million project to evaluate the potential for integrating various concentrated solar thermal (CST) technologies into the refining process, aiming to displace up to 50% of the natural gas consumed. Three pathways are being targeted: low-temperature digestion, solar reforming of natural gas, and high-temperature calcination. Technical and cost-effectiveness studies of various CST technologies are being carried out, and a reactor and modelling tools are being developed. The CST technologies could also eventually be used in other industries which require process heat and/or use natural gas. Research partners including the University of Adelaide (project lead), CSIRO, and the University of New South Wales are contributing over $600,000 in cash and $8.7 million of in-kind resources, further supported by $620,000 of in-kind contributions from industry partners including Alcoa of Australia Limited, IT Power, and Hatch. Australia is leading the Predictive Maintenance and Optimization work stream under the Affordable Heating and Cooling of Buildings Innovation Challenge (MI IC7). Australia prepared and presented a technical discussion paper on Predictive Maintenance and Optimization at the MI IC7 research experts’ workshop in November 2017. At the MI IC7 research experts’ workshop, experts identified the need for an Open Data Platform, in order to address energy wastage of up to 30% resulting from poorly maintained, degraded, and improperly controlled air-conditioning equipment. In response to this finding, Australia is working with other countries such as Canada, the US and the Netherlands on developing an Open Data Platform for energy efficiency and smart buildings research. The Platform will provide innovators with both access to low-cost high-quality data from buildings, and infrastructure to enable HVAC software-as-a-solution-services. The Open Data Platform will accelerate innovation and enable start-ups to thrive in the larger smart buildings ecosystem. It will collect a wide range of energy data, building data and other meta-data, and make it accessible (subject to privacy, and user access privilege restrictions set by the data owner) to empower the research and innovation community to develop data-analytics and other software-as-a-service products that (i) save energy (ii) improve operational efficiency, and (iii) enable other data services. CSIRO’s Opticool technology uses online feedback from occupants, weather data, and energy market pricing to alter the operations of the building’s heating, ventilation and air-conditioning (HVAC) control system. This technology enables HVAC systems to achieve a balance between cost savings, occupant comfort and energy efficiency. HVAC systems account for up to 50 per cent of commercial building energy use, and contribute to nearly 35 megatons of carbon dioxide emissions every year globally. The Opticool technology was commercialised by BuildingIQ and is applied in approximately 60 million square feet of commercial real estate floor space in Australia and the USA, including New York’s Rockefeller Centre. This technology results in energy saving of up to 30 per cent in commercial buildings, and could reduce HVAC energy consumption by up to 45 per cent. The Australian Government announced an AUD$5 million International Engagement Program in late 2017. This program, delivered through ARENA, aims to forge international collaborations between Australian scientists and industry experts and their international counterparts leading research, development, demonstration and deployment efforts overseas. The Program supports leading researchers and industry experts to participate in eligible International Energy Agency Technology Collaboration Programs and six of the seven Mission Innovation Challenges which focus on accelerating renewable energy development. Enhancing Australia’s participation in both of these international platforms will broaden access to world-leading information to improve Australian research outcomes and commercialisation prospects for Australian technologies. CSIRO has established the Partner Centre, which contains information on CSIRO’s collaboration work with research agencies, universities, small medium companies, multi-national companies and governments around the world. With over 5000 experts at 59 locations across Australia, Chile, France, Singapore, Indonesia and the USA, CSIRO is collaborating with many international partners to turn science into solutions that benefit Australians and the global community. Partnership with international universities and research institutions links CSIRO to 97 per cent of research which happens outside of Australia. CSIRO’s international collaboration work supports Australian foreign policy and trade agendas, including poverty alleviation and improving market access for Australian exporters and trading partners. Australia has a suite of government programs to support research and development and help emerging technologies make the transition from demonstration to commercial implementation. Research and development grants are provided by the ARENA, the Australian Research Council, CSIRO and universities. 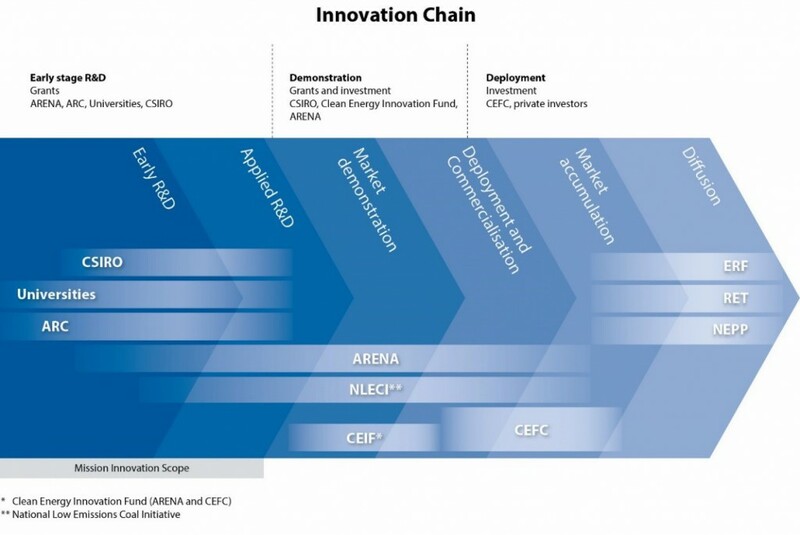 Seed funding for emerging technology is provided by the Clean Energy Innovation Fund and ARENA. The Clean Energy Innovation Fund will continue to provide financial support for innovative and emerging clean energy technologies to become commercially viable. It is funded from the CEFC’s capital allocation and has now committed approximately AUD$50 million of its AUD$200 million allocation in its second year of operation. The fund has supported technologies such as hybrid solar generation and storage energy management systems, electric vehicles in medium-duty trucks, and scaling up of the Internet of Things network focused on cutting energy use. This funding also includes an AUD$10 million cornerstone investment in a Clean Energy Seed Fund administered by Artesian Venture Partners. The Seed Fund targets scalable, high growth potential start-ups fuelling innovation and creating opportunities in the development of clean technology. The CEFC will continue to make clean energy debt and equity investments in later stage commercialisation and deployment projects on a commercial basis. Since its establishment on 1 July 2013, the CEFC has made cumulative commitments of more than AUD$4.3 billion to projects worth over AUD$11 billion. These investments focus on renewable energy, energy efficiency and low emissions technologies. Each dollar of CEFC investment commitments in 2016-17 was matched by over two dollars from the private sector, with the investment portfolio expected to earn a return above the Government’s cost of borrowing. Emissions reduction policies, such as the Renewable Energy Target and the Emissions Reduction Fund, will continue to help to pull innovations through to widespread market diffusion. This baseline has since been revised to AUD $108 million, reflecting differences between projected spend and actual spend in financial year 2015-16, as well as improved data in relation to the above activities. The baseline excludes research and development spending on fossil fuels, electricity transmission and distribution networks, recoupable investments made by the Clean Energy Finance Corporation (CEFC), and expenditure on later stage deployment. Research and development in low carbon technologies, including end use energy efficiency, renewable energy, nuclear energy, electric grid technologies, carbon capture and storage, and advanced transportation systems and fuels. Investments are implemented through a number of mechanisms including cost-shared projects with the private sector, research and development activities at the National Laboratories, grants to universities, and support for collaborative research centers targeted to key energy technology frontiers.